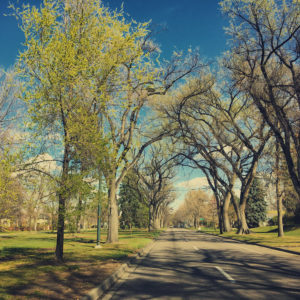 National Landscape Architecture Month is an opportunity to celebrate and learn about many of the historic resources in the National Register of Historic Places and the Colorado State Register of Historic Properties. Saco Rienk DeBoer was born in the village of Ureterp in the Netherlands in 1883. Suffering from tuberculosis, he moved to America in 1908 in search of drier conditions to ease his condition. After a brief stay in Maxwell City, New Mexico, DeBoer moved to Denver. He found work at the old city nursery and as a teamster for the Denver City Parks Department. After converting a dump on Cherry Creek into Sunken Gardens Park, DeBoer’s work caught the eye of Mayor Speer. When the city’s first landscape architect Reinhart Schuetze died in 1910, Mayor Speer named DeBoer as his successor. DeBoer designs include East 6th Avenue (1909-1912), East 7th Avenue upper parkway (1914-1927), East 17th Avenue upper parkway, Hungarian Freedom Park (formerly Arlington Park) (1925), and Cheesman Park Esplanade (1912), among other parks around Denver. All are listed in the National Register of Historic Places under the Denver Park and Parkway System thematic resource nomination. DeBoer died in 1974, having served as Denver’s landscape architect through 1931. The Office of Archaeology and Historic Preservation’s growing list of historic places with significant landscape features and guidance related to cultural landscapes can be found at: http://www.historycolorado.org/cultural-landscapes-guidance. Authorized by the National Historic Preservation Act of 1966, the National Park Service's National Register of Historic Places is part of a national program to coordinate and support public and private efforts to identify, evaluate, and protect America's historic and archaeological resources, and is the official list of the Nation's historic places worthy of preservation. The Colorado State Register of Historic Properties is a listing of the state’s significant cultural resources worthy of preservation for the future education and enjoyment of Colorado’s residents and visitors.